Do something with a future. Your chance in machine building is the motto of the Special Youth Show at the METAV 2018 from 20 to 24 February in Düsseldorf. The opportunities were never so good to find a thrilling, demanding and also very well paid career in metalworking. “The machine tool industry is currently having a heyday,” says Peter Bole, Director of the Youth Education and Development Foundation, Bielefeld, which is organising the special booth and inviting students, teachers and trainers to the METAV. “Companies have to mobilise all capacities to be able to deliver the many orders,” says Bole. However, in certain professions such as mechatronic engineers or IT specialists, the number of open positions is sometimes being faced by only half as many or even fewer specialists looking for work, according to information from the Federal Employment Agency (BfA). This concerns the machine tool industry, its customers and its component suppliers equally. A highlight at the Youth Education and Development Foundation’s special booth for youth is a process chain from the drawing up to as-sembly of a Formula 1 model car. Young visitors concentrate on their work building this model. The Youth Education and Development Foundation wants to counter-act the shortage of specialists by demonstrating to young people the attraction of vocational training in metalworking. 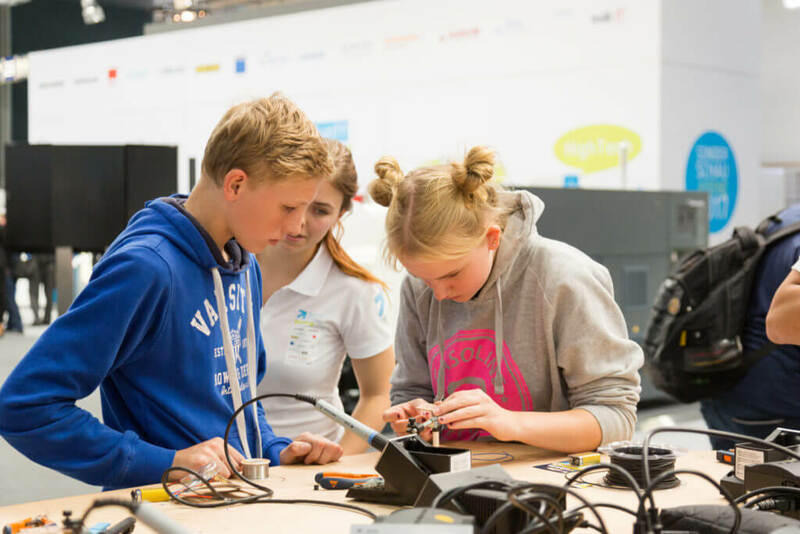 Therefore 13 well-known companies and institutions will be advertising for careers in machine building and systems engineering in hall 17, booth A89 at the Düsseldorf exhibition centre. “The concept of the Special Youth Show primarily envisages getting all participants on board,” explains Bold. “We have to win over young people for voca-tional training. But then, they must have the current training content communicated to them in the best possible way,” challenges Bole. Today, this still includes basic knowledge in metalworking but also knowledge of CAD/CAM technology, digital manufacturing processes, networking technologies and software programming in the context of Industry 4.0. One of these aids is the mobile learning platform, MLS. It is aimed at providing an application over the Internet that can be used in the re-spective working and learning environment on a mobile device. Via this platform, the multipliers can create work tasks and assign them to their trainees. There are pre-made standard tasks available for this and equally the possibility to very easily create individual tasks. With this offer, the training folder is now a thing of the past. The multipli-ers can look at the learning and work progress of their protégés, evaluate the results and provide feedback centrally and very conveniently. All experts are in agreement that in the future, skilled workers will have to make more decisions, for example in process optimisation, quality assurance or preventive maintenance, and that they will perform more communication tasks and take on a controlling function due to the higher amount of coordination work. “Therefore, the trainees must be capable of developing and documenting problem solutions and be self-organised, also for new technological requirements,” says Bole in conclusion. That is an important development task for the training. Hence, with its possibilities of networked working and learning, MLS is the suitable preparation of future skilled workers in the networked pro-ductions systems in Factory 4.0.